A sticky mess? 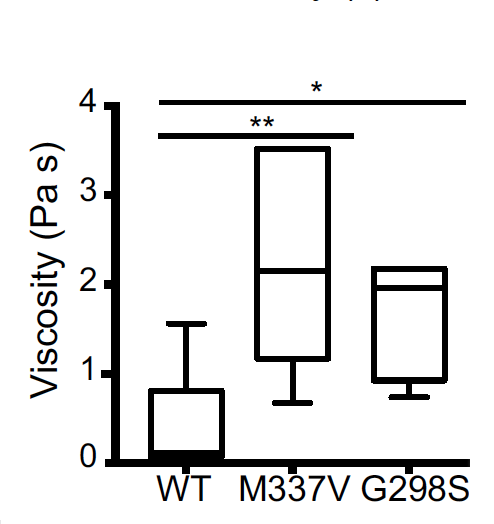 ALS-linked mutant TDP-43 RNA granules may be stickier, which may result in aggregation and potentially RNA dysregulation, toxicity and disease. (Courtesy of Gopal et al. 2017, PNAS). Cells form RNA granules under stress to focus their energy on producing proteins needed for survival. These stress granules, which are assembled through a biophysical process known as a liquid-liquid phase transition, are membrane-less organelles that keep mRNAs out of cytoplasmic circulation by sequestering them, likely stalling their translation during the initiation phase (Buchan and Parker, 2009). The assembly of stress granules, according to in vitro studies, is driven by low-complexity sequence domains (LCDs) of RNA-binding proteins (RNPs) including FUS and hnRNPA1 (see October 2015 news; Kato et al., 2012). But in ALS, these sequences can be disrupted, leading to biophysical changes in these granules which may contribute to the disease (Kim et al., 2013; Molliex et al. 2015; Murakami et al., 2015; Patel et al., 2015). Now, a University of Pennsylvania team led by Erika Holzbaur report that ALS-linked mutations in the LCD of TDP-43 increase the viscosity of RNA granules and impair their mobility within cultured rat cortical axons (Gopal et al., 2017). The findings suggest that stress granules are fluid and dynamic. But in ALS, these granules become sticky and therefore, may aggregate, which may lead to RNA dysregulation, toxicity and neurodegenerative disease (Lagier-Tourenne et al., 2012; Murakami et al., 2015). The study is the first to investigate the potential impact of ALS on the biophysical nature of RNA granules in neurons. The findings are published online on March 6 in the Proceedings of the National Academy of Sciences. Researchers first suspected that stress granules may play a role in ALS by studying the role of ALS-linked RNA-binding proteins in the disease (Bosco et al., 2010, Dormann et al., 2010). However, in more recent years, researchers discovered that these RNA granules may play a more general role in ALS, including the most common form of the disease. Toxic stress Arginine-rich dipeptide repeat proteins (DRPs) can form stress granules in vitro suggesting that these granules may also play a role in C9orf72 disease. The findings build on previous results that found that DRPs could bind LCDs of RBPs including TDP-43 and FUS (see October 2016 news; Lee et al., 2016; Lin et al., 2016). (Courtesy of Boeynaems et al., 2017, Molecular Cell). Arginine-rich dipeptide repeat proteins associated with C9orf72 ALS appear to drive the formation of stress granules – at least in vitro according to a study published this week in Molecular Cell (see March 2017 news). The study, led by University of Leuven’s Ludo van den Bosch in Belgium, adds to growing evidence that these dipeptide proteins may also contribute to the C9orf72-linked form of the disease (see March 2016 news; Khosravi et al., 2016; Zhang et al., 2016). The report comes at the heels of a 2014 study from the laboratory of Aaron Gitler at Stanford University in California that found that ALS-linked mutations in profilin 1 led to defects in RNA stress granule dynamics (Figley et al., 2014). Together, the results suggest that changes in the biophysical nature of stress granules may be a general mechanism of ALS. And, targeting the assembly of these stress granules may be helpful in tackling the disease. Gopal PP, Nirschl JJ, Klinman E, Holzbaur EL. Amyotrophic lateral sclerosis-linked mutations increase the viscosity of liquid-like TDP-43 RNP granules in neurons. Proc Natl Acad Sci U S A. 2017 Published online Mar 6. [PubMed]. Boeynaems S, Bogaert E, Kovacs D, Konijnenberg A, Timmerman E, Volkov A, Guharoy M, De Decker M, Jaspers T, Ryan VH, Janke AM, Baatsen P, Vercruysse T, Kolaitis RM, Daelemans D, Taylor JP, Kedersha N, Anderson P, Impens F, Sobott F, Schymkowitz J, Rousseau F, Fawzi NL, Robberecht W, Van Damme P, Tompa P, Van Den Bosch L. Phase Separation of C9orf72 Dipeptide Repeats Perturbs Stress Granule Dynamics. Mol. Cell 2017. Published online March 16. Kato M, Han TW, Xie S, Shi K, Du X, Wu LC, Mirzaei H, Goldsmith EJ, Longgood J, Pei J, Grishin NV, Frantz DE, Schneider JW, Chen S, Li L, Sawaya MR, Eisenberg D, Tycko R, McKnight SL. 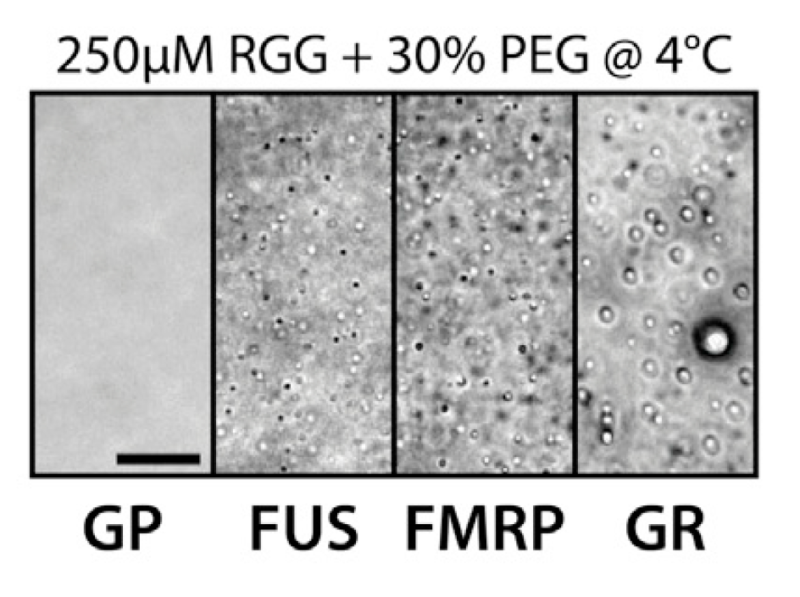 Cell-free formation of RNA granules: low complexity sequence domains form dynamic fibers within hydrogels. Cell. 2012 May 11;149(4):753-67. [PubMed]. Kim HJ, Kim NC, Wang YD, Scarborough EA, Moore J, Diaz Z, MacLea KS, Freibaum B, Li S, Molliex A, Kanagaraj AP, Carter R, Boylan KB, Wojtas AM, Rademakers R, Pinkus JL, Greenberg SA, Trojanowski JQ, Traynor BJ, Smith BN, Topp S, Gkazi AS, Miller J, Shaw CE, Kottlors M, Kirschner J, Pestronk A, Li YR, Ford AF, Gitler AD, Benatar M, King OD, Kimonis VE, Ross ED, Weihl CC, Shorter J, Taylor JP. Mutations in prion-like domains in hnRNPA2B1 and hnRNPA1 cause multisystem proteinopathy and ALS. Nature. 2013 Mar 28;495(7442):467-73. [PubMed]. Murakami T, Qamar S, Lin JQ, Schierle GS, Rees E, Miyashita A, Costa AR, Dodd RB, Chan FT, Michel CH, Kronenberg-Versteeg D, Li Y, Yang SP, Wakutani Y, Meadows W, Ferry RR, Dong L, Tartaglia GG, Favrin G, Lin WL, Dickson DW, Zhen M, Ron D, Schmitt-Ulms G, Fraser PE, Shneider NA, Holt C, Vendruscolo M, Kaminski CF, St George-Hyslop P. ALS/FTD Mutation-Induced Phase Transition of FUS Liquid Droplets and Reversible Hydrogels into Irreversible Hydrogels Impairs RNP Granule Function. Neuron. 2015 Nov 18;88(4):678-90. [PubMed]. Patel A, Lee HO, Jawerth L, Maharana S, Jahnel M, Hein MY, Stoynov S, Mahamid J, Saha S, Franzmann TM, Pozniakovski A, Poser I, Maghelli N, Royer LA, Weigert M, Myers EW, Grill S, Drechsel D, Hyman AA, Alberti S. A Liquid-to-Solid Phase Transition of the ALS Protein FUS Accelerated by Disease Mutation. Cell. 2015 Aug 27;162(5):1066-77. [PubMed]. Bosco DA, Lemay N, Ko HK, Zhou H, Burke C, Kwiatkowski TJ Jr, Sapp P, McKenna-Yasek D, Brown RH Jr, Hayward LJ. 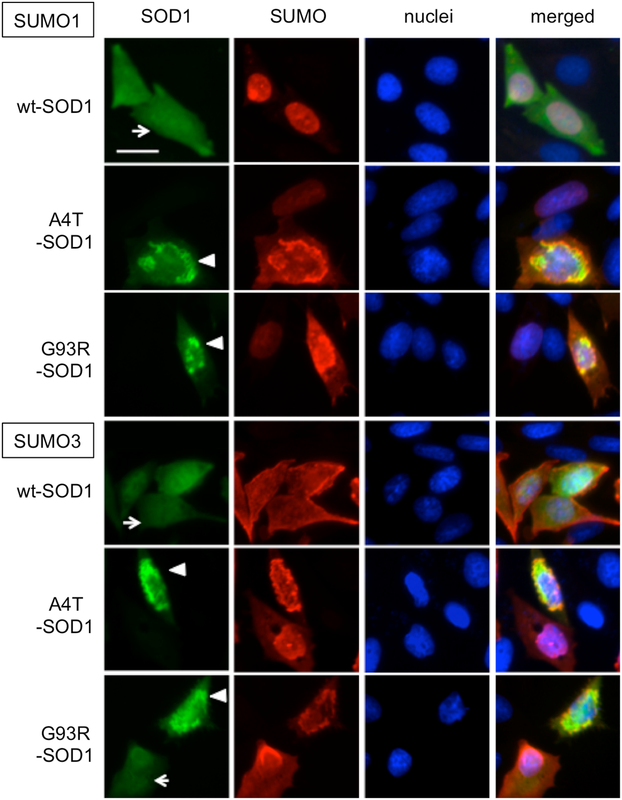 Mutant FUS proteins that cause amyotrophic lateral sclerosis incorporate into stress granules. Hum Mol Genet. 2010 Nov 1;19(21):4160-75. doi: 10.1093/hmg/ddq335. [PubMed]. Dormann D, Rodde R, Edbauer D, Bentmann E, Fischer I, Hruscha A, Than ME, Mackenzie IR, Capell A, Schmid B, Neumann M, Haass C. ALS-associated fused in sarcoma (FUS) mutations disrupt Transportin-mediated nuclear import. EMBO J. 2010 Aug 18;29(16):2841-57. [PubMed]. Figley MD, Bieri G, Kolaitis RM, Taylor JP, Gitler AD. Profilin 1 associates with stress granules and ALS-linked mutations alter stress granule dynamics. J Neurosci. 2014 Jun 11;34(24):8083-97. [PubMed]. Image on home page: A model of a stress granule (Wheeler et al., 2016). Reproduced under a CC BY 4.0 license. eLife.